NEW Platinum Quality Material! Platinum Shield SUV Covers provide top level protection against all the elements including rain, snow, wind, UV / Sun rays, and more. Extremely durable exterior with soft fleece lining on interior. Will this fit over my spare tire? Yes, the car cover will fit over your spare tire mounted on the back of your SUV. If it's an aftermarket add-on, please let us know by mentioning the aftermarket item in the "comments" box on the checkout page. We'll be sure to send the correct cover based off your comment! The Platinum Shield cover comes with a FREE cable & lock, FREE storage bag, FREE 3 Pack Of Microfiber Dusting Cloths AND an antenna patch. Note: 360 Degree Video Shows the Platinum Shield Material On A Car. 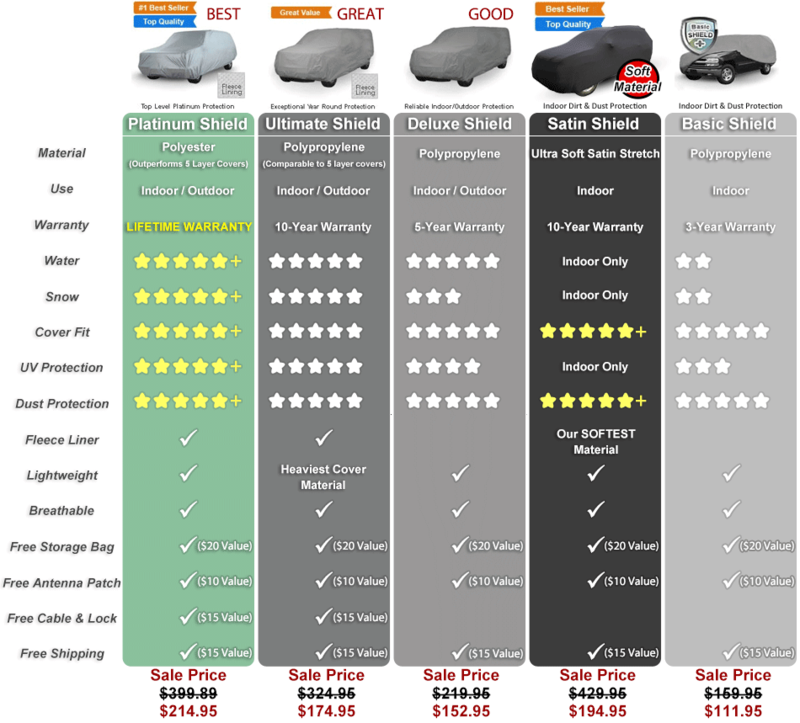 Deluxe Shield SUV Covers are great outdoor covers. They offer amazing protection against rain and the elements. Perfect for high moisture areas. The Deluxe Shield cover is safe to use in all types of weather conditions. It is weatherproof and is ideal for anything from high moisture climates. The Deluxe Shield has a special multi-layer polypropylene, which is an oil based material, with a layer of micro-porous film sandwiched between it to ensure breathability. On the inside of the cover, there is a non abrasive interior. The Deluxe Shield cover is comparable to a three (3) layer cover. Not all three layer covers are made equal however. Our covers are made from the high quality, thick grade materials to ensure long lasting protection. The Deluxe Shield is made from a special multi-layer polypropylene, with a layer of micro-porous film sandwiched between it to ensure breathability. This cover comes with a FREE storage bag and an INCREDIBLE 5 YEAR LIMITED WARRANTY! Basic Shield SUV Covers are great indoor covers. Great protection against dirt and dust! Basic protection at a great price.